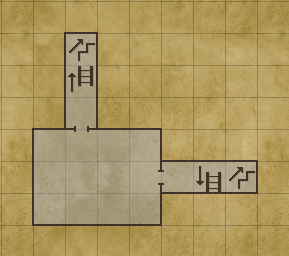 Will Grid Cartographer Version 4 have more door icons? Hey, Christmas is early this year! Holy crap that is wonderful! Thank you very much for adding that in. Ok, on the buy page, you have four versions for sale. I just want to make sure I get the right version. I already own Grid Cartographer Version 3 Pro (the paid for version). I only use your software to map out old games. So I am guessing the version I want is 'Upgrade V3 to Pro' for $15.99 -- is that right? However, can we have a locked door in "hollow-box" style as well? The same as open door but filled in black? Like this? Hope it's not too much trouble. glaymore wrote: It's Christmas time! No problem I'll put that on the todo list! MikeSol wrote: Holy crap that is wonderful! Thank you very much for adding that in. MikeSol wrote: Ok, on the buy page, you have four versions for sale. I just want to make sure I get the right version. I already own Grid Cartographer Version 3 Pro (the paid for version). I only use your software to map out old games. So I am guessing the version I want is 'Upgrade V3 to Pro' for $15.99 -- is that right? That's right - as a previous v3 owner you qualify for a discount upgrade to v4 pro. So yes, you want the "v3 to Pro" button that you menitioned. Ok I clicked on the $15.99 upgrade and filled out the form. I am just waiting for your email now so I can proceed. -- Nevermind, I got the email. I like glaymore's idea of a filled in door for a locked door. Maybe you could consider taking that a step further and providing a filled in door for magically locked and jammed doors as well at some point? Like maybe blue or purple for magically locked doors and red for jammed doors. But even just glaymore's suggestion of a locked vs a unlocked door would be great. Last edited by MikeSol on Sep 28, 2016 13:25, edited 2 times in total. David, I've seen a couple of issues in GC4 unrelated to doors that don't seem quite clear, so I'd like to have your opinion. 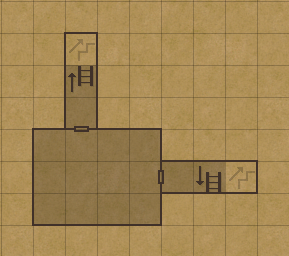 1) Stairs color is now very pale compared to any other on-map icons. Is there any reason for this? It is not critical of course, but looks a bit out of place. 2) Stairs icons are no longer compatible with the "simple block" background. I use this background a lot to color the rooms on my maps (I know it's not intended for this but it looks nice ). In GC4, any icon except the stairs can exist on a cell colored as "simple block". Drawing the stairs removes the simple block from the cell, and vice versa. If there's any reason for this, I don't comprehend it. 3) Simple block is now a bit darker than the default background (at least for the Parchment theme). In GC3, it was a bit lighter. Okay, now we have the mighty palette tool (which i absolutely love, btw), let's change the simple block color to my liking! But the simple block's color is locked and cannot be edited; it's the only color in the palette that cannot be edited. Pity. To illustrate all 3 points, I made this example map. I hope the differences between versions are clear. BTW, the new parchment background is much nicer than in GC3! MikeSol, you can draw the doors of whatever color by using the palette tool. The same applies to the walls and any icons. I find it most useful when mapping multiple teleporter entrance/exit pairs; color-marking really helps to distinguish between them. Hi the reason for the stairs and ramps looking like that is they're now terrain. It was a very late change to v4 but I did post about it in the dev log. The reasoning is that as a marker it didn't actually make sense (GC3 stairs were akin to portable folding stairs) and didn't allow markers to be drawn on top. 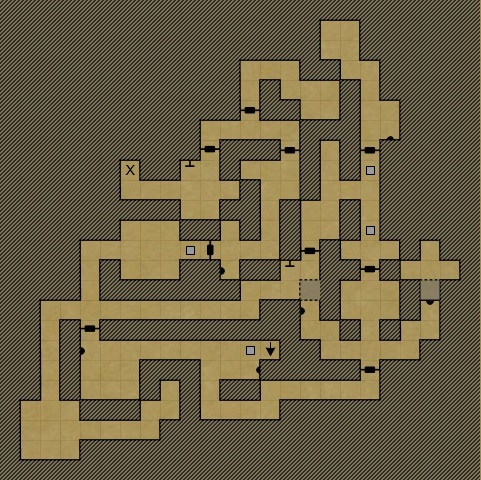 To get the old stair style back, I think the quickest option is to add them as a custom tile on the marker layer. Or use the colours to tint them darker (but then you don't get the ability to put a simple block underneath). Going forward I agree they could perhaps be displayed more prominently. I want to keep stairs as terrain internally but they could be displayed differently with an option. David Walters wrote: I want to keep stairs as terrain internally but they could be displayed differently with an option. David, the custom tile method works fine for me, no problem. I just wanted to understand the reason for this change. Now it makes sense Your explanation is appreciated! Any hints on changing the color of the simple block? glaymore wrote: Any hints on changing the color of the simple block? The quickest workflow I think would be to use the wand tool ('W'), select them all (hold shift to append), select a colour from the palette, and then use the Edit > Fill tool (ctrl+backspace) to repaint them.